For decades the strong and energetic volunteer sector was one of the most effective mechanisms that the Maltese community counted on and that Government can engage to further a Social Inclusion agenda in Maltese society for the benefit of individuals, communities and government alike. While the work of the volunteer sector is acknowledged and over the years has left its mark within our community, there is the risk that due to the constraints under which the sector currently operates and the future challenges that it will encounter, its sustainability may be undermined. In the past decade the Malta Council for the Voluntary Sector was established as the body advocating on behalf of the voluntary sector with Government , while engaging with the same sector in its development and growth. Following the European Year of the Volunteer 2011, the Council started to push further volunteering on the National Agenda which would eventually lead to the establishing of a National Volunteer Strategy establishing a long term vision for the sector. A National Volunteer Strategy would provide connection and co-ordination across both National and Local Government to support better on all dimensions the volunteer sector and make better use of all available resources. A National Volunteer Strategy would focus on co-ordinating research, consultation with the sector and implementation of reforms to support the sector at an organisational and individual level. A truly national strategy must provide an opportunity for coordinated policy development and decision-making at the national and local levels that will be reflected in specific national and local actions. 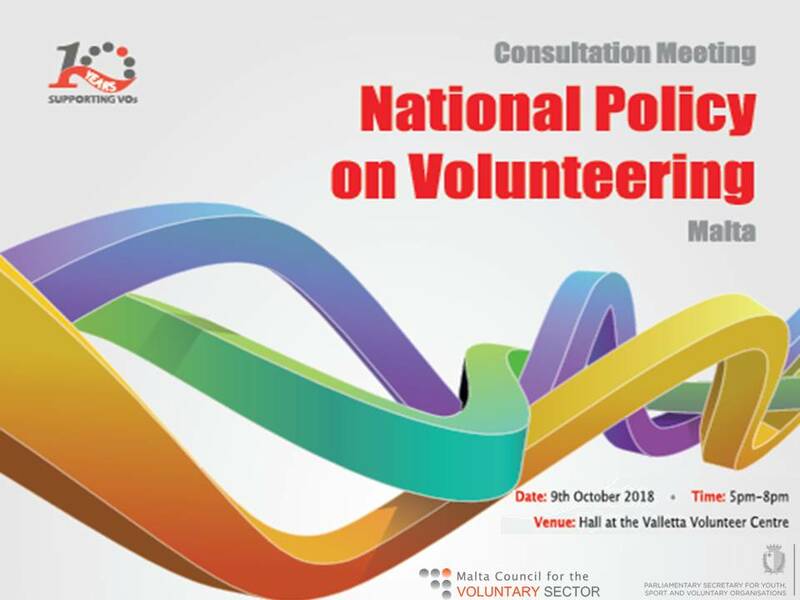 The Discussion Paper on National Strategy on Volunteering 2018 is being presented as part of the consultation process with the sector and is intended to come up with a strategy that will see all stakeholders agreeing on a common way forward in the interest of the same sector and community at large.